When I got down from the bus at Amingad at 8:30 AM on a beautiful Friday morning (Dec 28th), it appeared to have just woken up. Thanks to the bus conductor who directed me to wait for shared transport that ply frequently from here to Aihole. Until half an hour before, I was still contemplating on whether to go to Bagalkot and take a bus to Badami or take this route. Finally, I decided to visit Aihole first and avoid more traveling for the day. The kind conductor politely explained me that I could stay in an Inspection bungalow and on Sunday when I return, I could come to Ilkal and board the same bus at around 10:45PM. I thanked him and got down at Amingad as the KSRTC bus that I had boarded last night made its way to Bagalkot which is another hour’s drive ahead. In no time I was on a jeep shared by villagers going to Banashankari temple. With only one seat left, I struggled in a back seat as the tempo trax rolled on a muddy village road. The travel had just begun to get exciting. I occasionally enjoy traveling alone as I believe that nothing is more adventurous, exciting and educative than traveling alone. It would have been more exciting if it were a foreign land but for me that day is yet to come. My last solo trip was in Dec 2009 to Kolar so this was much awaited. At Aihole, I first tried to locate the IP bungalow. But what I found was an abandoned place. I spoke to villagers and they informed that the pravasi mandir is now closed and I might not find any hotel to stay here. After freshening up lightly at the village, I started my onward journey. A cup of tea and idly got me started. Aihole has several temples scattered all around the village. But the main complex houses several important temples, Durga temple, Lad Khan Temple, Galaganatha group temples etc. 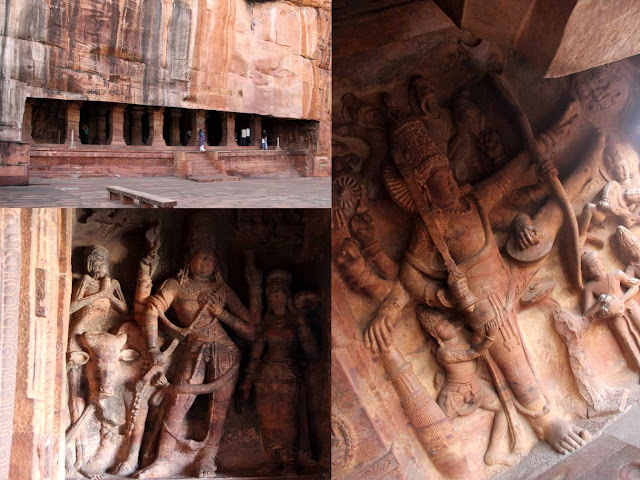 According to mythology Aihole is the place where Parashurama washed his axe after killing the Kshatriyas. Aihole was the first capital of the early Chalukyas. Here they built over 125 temples in various styles and is said to be a laboratory of experiments in rock cut architecture. 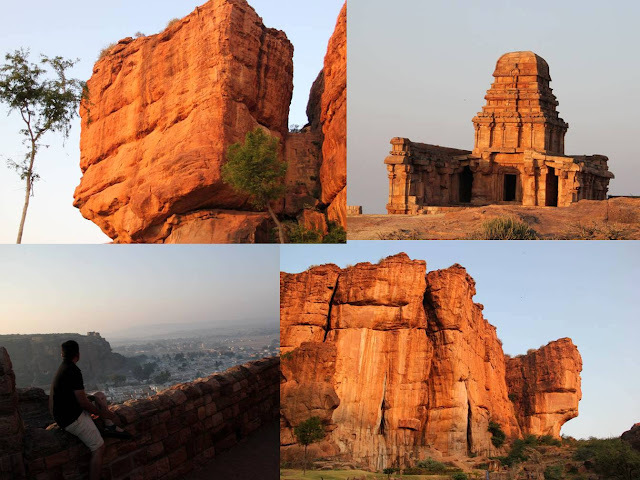 Pulakesi I, one of the greatest rulers of this dynasty, moved the capital to Badami nearby. Badami was then known as Vatapi. It is from these temples that the Chalukyas gained their experience and went on to build the great temples of Pattadakal. The first phase of temple building in Aihole dates back to the 6th century CE, the second phase up to the 12th century CE. Some temples were even built as early as the 5th century CE. 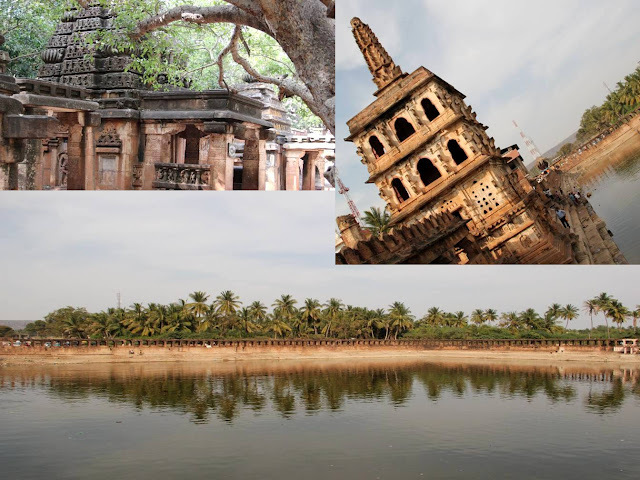 All three cities where built at the banks of Malaprabha river. Other places that I visited here were a fort on top of a small hill with a Meguti Jain temple, Ravana Phadi cave temple, Hucchimalli Gudi etc. With that, I decided to bid farewell to Aihole and headed to Pattadakal (14Kms). A shared auto was ready for that. The auto prices are around Rs 5, 10 or max 15 depending on the distance. Pattadakal too was crowded with school kids. There are several temples around here and some have north Indian influence to their gopura. 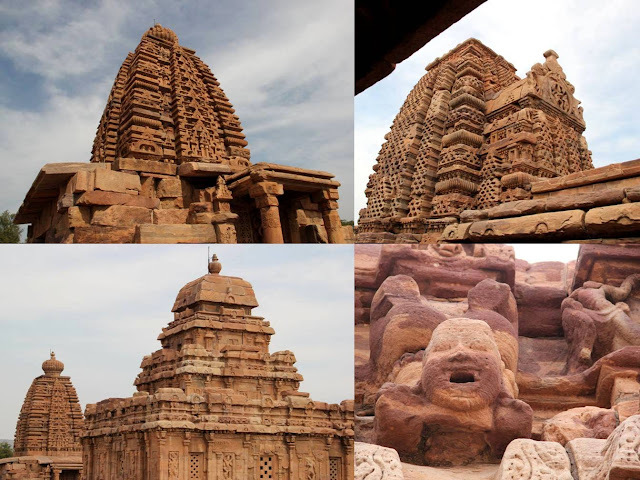 At Pattadakal (place for Chalukyas Coronation) there are ten temples including a Jain sanctuary surrounded by numerous small shrines and plinths. Four temples were built in Chalukya Dravidian style, four in Nagara style of Northern India and the Papanatha temple in mixed style. Apart from the main temples, there is another papanatha temple which is behind the main temples. While walking to the temple, I saw these two villagers having their lunch and as soon as they saw me, they asked if I would like to eat. I nodded. This was happening for the second time to me in northern Karnataka. Last time when my mother and I stopped at a sunflower field near Gadag, the villagers had offered us food. There is something very nice about these villagers of North Karnataka, they always offer food to people. They gave me lots of tasty food – Bhakri (Roti made of corn), Chapathi, Cur rice, two sabjis and sweet. After a nice meal, I visited the temple and bid farewell to pattadkal too. 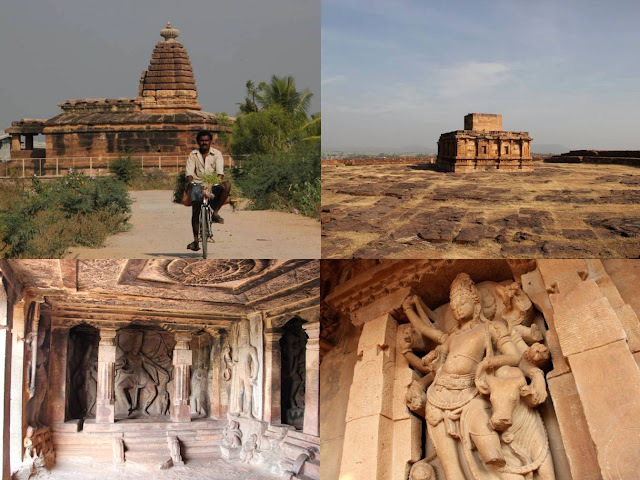 I was informed by someone that there are three more temples on the way to Badami – Mahakuta temples, Shiva mandir and Banashankri. So since I had time, I thought let me cover everything. A bus took me to a cross where I got down and waited for a shared auto. But there were no auto traveling to Mahakuta. I was suggested to hire an auto for Rs 50. After a wait of half an hour, I decided to go. There is a point where you have to take certain decisions else you would end of wasting time. Mahakuta temples are ancient too but the lake was filled with devotees swimming and hanging their clothes on the rails next to the temple. Such sights depicted untidiness and ignorance disappoints me. Next, I took another auto to Shivamandir, which is on the way to Banashankari. Now this is a newly constructed temple and hence not very special from an architectural perspective. I quickly got another auto to Banashankari which seemed extremely crowded. The temple had long queue so I decided to pray from outside. Walked around and left to Badami on another auto. I was at Badami at around 4:00 PM. I checked into a newly built hotel called – Hotel Sanman Delux. The rooms are reasonable at Rs450 per night. The construction is new and rooms are built away from the main road hence avoiding noise. I took a nap and then at around 6 went out to visit the caves. By the time I reached the caves, it was closing. So instead I sat by the Agastya lake. It was peaceful as the evening sky changed colors until it was finally dark. The lodge owner suggested a local khanawali where I had good delicious north Karnataka style meals. Next morning, I was back at the Agastya Lake at around 7:00 AM. The sun rises behind the Bhootnath temples and thus the opposite hill made of sand stone shined in color of an almond (Badami). I climbed up this hill where there is a beautiful temple. (Upper Shivalaya) Nobody was around and thus it made a nice and quiet place to be. I met a guy from Belg there with whom I spoke in French. He seemed quite impressed by my knowledge of the language and I learnt some better pronunciation from his accent. After a small chat I returned back to the lake. I visited Bhoothnath temple and the caves behind it which has beautiful Buddha and Vishnu idols. At the base is an archeological museum that has some rare sculptors and paintings from the caves. By now it was around 10 and I could hear groups of students walk into the caves one after another. Their talks from a distance sounded like bees continuously passing by. There are four caves in here. One dedicated to Shiva, two to Vishnu and one to Bahulbali signifying the different religious path the Chalukya’s took and unity they maintained in them. The sand stone sculptors on each cave are amazing and magnificent. Here I met three French students who were doing their MBA in Delhi on an exchange program. I had a good chat with them too and caught up on some pronunciation. It really helps to speak with French nationals to pick up what you learn. Evening, I returned to the Agastya Lake and sketched. Morning when I was sitting near Bhoothanath temple and sketching, the guard politely told me that I could not draw which I found to be funny because they let people take photographs. Evening, sitting by the Agastya Lake for few hours I watched the sun set and display brilliant light work on the east side, where the temple is. I sat there by the lake for hours and felt happy. It was peaceful out there. I watched several tourists with their SLR cameras clicking their best shots. People from all over the world seemed to be there. It was a fulfilling experience. I walked around the village, The tiny roads, cramped houses, pigs and all dirt looked so untidy in the beginning, but now as I am to leave this all behind, they all look so part of Badami and I was getting used to them. I was enjoying the walks around the tiny streets and watching villagers relax in the courtyard as the sun set. Next morning, I boarded a bus to Bangalore at 7:30 AM. It is a Karnataka Sarige bus; hence it would stop at every major town on the way. I knew it and preferred it. I was okay looking at the villages that passed by and enjoy the scenery. It is here that I met biscuit man. He and I were the only two, traveling from Badami to Bangalore. When I did not go for breakfast, he brought back a pack of biscuit and offered me. He seemed disappointed that I took my lunch at the dabha while he settled for another pack of biscuit. Then in the evening after tea, he shared few more biscuits with me. By the time we reached Bangalore he was all smiling and bid me farewell before he left. By the time, I reached Bangalore it was almost 9:00 PM and I was damn tired by the bus journey but happy to have spent two days in a beautiful place with great history; where people are so very kind, polite and nice. I will always cherish this solo travel of mine. Gorgeous pictures, and cool write-up! Seems like we were there at almost the same time in Badami (we were there on 29th Dec)..Quelle Coincidence ! Hey nice write up. I'm planning to go there in feb.